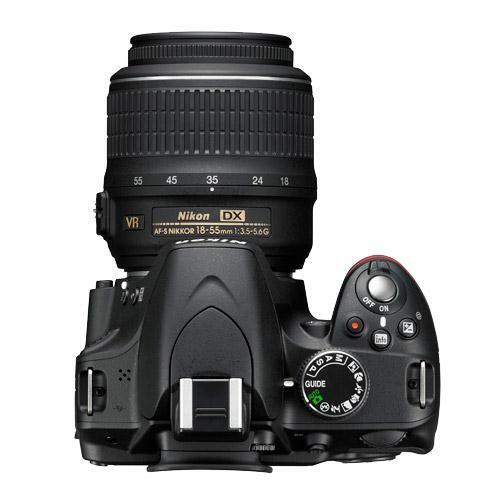 Nikon D3200 Digital SLR Camera in Black + 18-55mm VR II Lens. 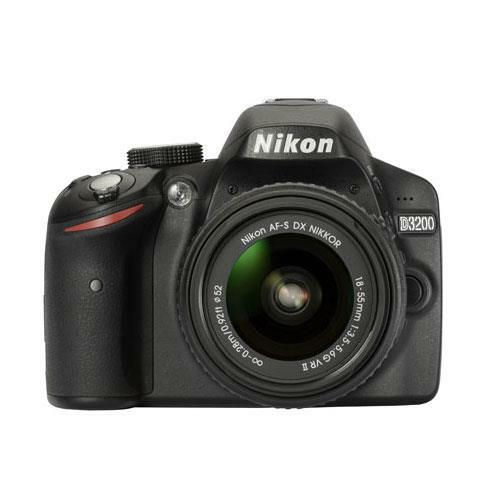 The easy-to-use Nikon D3200 boasts an incredible 24.2-megapixel CMOS image sensor, an 11-point autofocus system, Full HD D-Movies plus Nikon’s Guide Mode to help achieve stunning results in a few simple steps - all housed in a lightweight body. Capture sharp, detailed images with the 24.2-megapixel CMOS sensor. Big prints look superb and you can crop images without losing any detail. New to Digital SLR Photography? 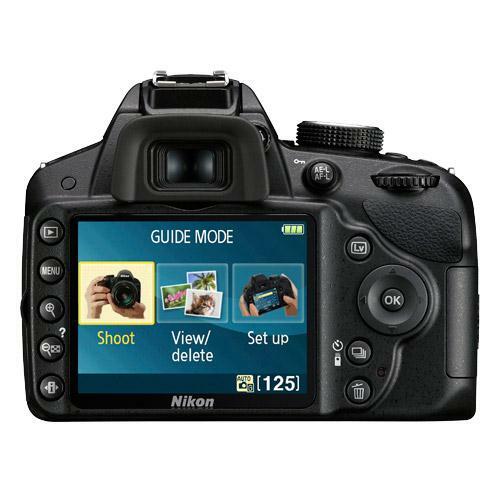 The Guide Mode on the D3200 uses sample images and clear instructions to show you how to take great photos in a few simple steps. 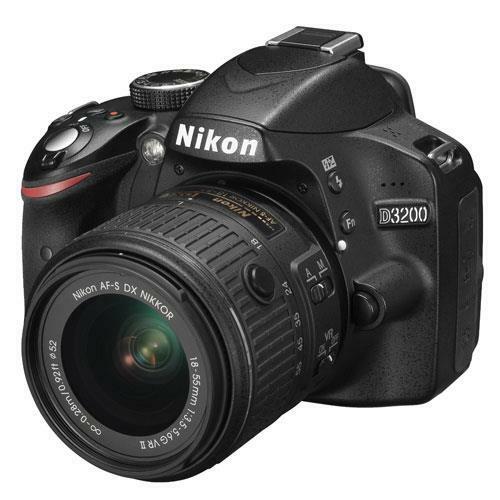 The Nikon D3200 features a lightweight body and superior ergonomics make it a pleasure to shoot with. A secure grip makes the camera comfortable to hold. Dedicated one-touch buttons for frequently used functions like D-Movie, or live view, make it easy to operate. Make movies you’ll want to share with Nikon D-movie. With the camera’s large image sensor and high ISO, you can record sharp Full HD (1080p) video clips in any light. You can record Full HD (1080p) movies in 30p, 25p and 24p, and the camera supports use of Nikon’s ME-1 stereo microphone. In-camera edit functions let you perform tasks such as setting the start and end point of your movie. A mini HDMI output enables playback on an HDTV. Enjoy fast and precise autofocus coverage throughout the frame whether your subject is off-centre, moving fast or completely unpredictable. 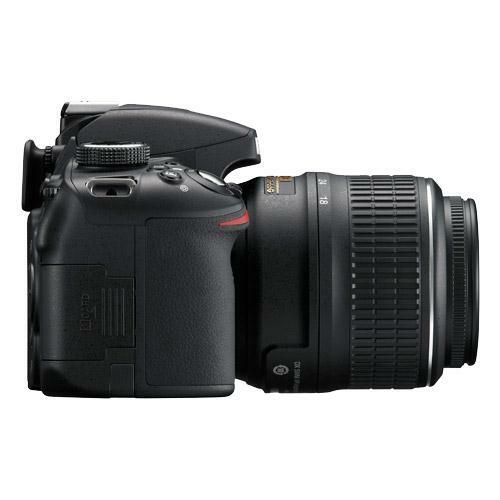 Nikon’s fast and powerful image processing engine provides high-speed operation, remarkably clear images with excellent colour reproduction, and enhanced movie recording. Let the D3200 help you capture superior images. Nikon’s Scene Recognition System will meticulously analyze the scene you’re shooting and adjust the focus, exposure and white balance for optimum results. Enhance your photos in-camera with a range of tools and effects. Retouch tools include Resize, Quick Retouch and Straighten. Effects include Selective Colour, Colour Sketch, and Miniature Effect, which makes distant subjects look like scale models. High ISO (100–6400) is extendable up to 12800. Wireless Mobile Adapter: use the optional WU-1a to share images directly from the D3200 to a smartphone or tablet, or to control the camera remotely via your smart device. 4 fps continuous shooting: shoot action at a swift four frames per second. Active D-Lighting: capture more detail in high-contrast lighting conditions. Nikon’s Active D-Lighting automatically captures the details in both dark and bright areas. Smart autofocus for movies: enjoy continuous autofocus (AF) when you shoot D-movies. Full-time servo AF (AF-F) and subject-tracking AF maintain the focus when you shoot moving subjects.